Scientific data that's spatially analyzed produces highly useful information for academics, scientists, and other researchers, helping them better answer questions and make well-informed decisions. 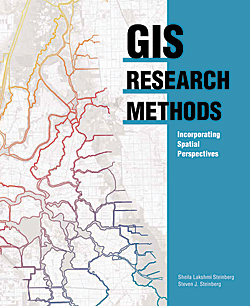 GIS Research Methods: Incorporating Spatial Perspectives, published by Esri, shows how spatial analysis using GIS technology enhances research in the social and physical sciences. In the book's foreward, the authors note that, "A unique aspect of this book is that we focus specifically on how to integrate GIS into both qualitative and quantitative research. Our objective in writing this book is to provide a foundation for GIS research methods and, more specifically, to integrate spatial thinking and spatial analysis into a research tool with clear methodological techniques." Sheila Lakshmi Steinberg is a professor of social sciences at Brandman University, based in Irvine, California. She earned her bachelor's degree from the University of California, Santa Barbara; her master of science degree from the University of California, Berkeley; and her doctorate from Pennsylvania State University. Her research interests include environmental sociology, culture, and GIS.